Perpetrators of war crimes in Syria are getting away with their crimes. But a coalition of Syrian civil society, activists and lawyers with support of the ECCHR and Heinrich-Böll-Foundation have filed criminal complaints in Germany against some high-ranking Syrian officials under the principle of universal jurisdiction. A first step towards justice for the victims and survivors of all crimes committed in Syria. 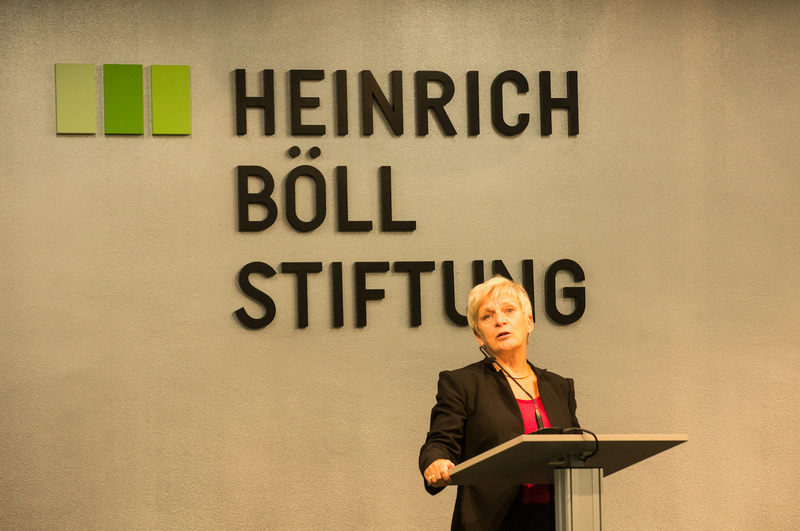 Barbara Unmüßig, President of the Heinrich Böll Foundation gave the following opening speech at the event “Towards Accountability for International Crimes in Syria”. it is my pleasure to welcome you here in the Heinrich-Böll-Foundation today. The event tonight is the second one of its kind. In March, we already hosted an evening full of moving discussions on the war and crimes perpetrated in Syria. The Syrian lawyer Mazen Darwish, who is our guest again tonight, then said that the mere possibility of seeking justice for what is happening in his home country meant the world to him. “In order to pave the way for true reconciliation and a lasting peace, you need to ensure people’s belief in non-violence, the law, and international norms. Justice is a key element of this process”, he said. This is why, once again, we want to explore what justice can mean for Syria and how we might be able to achieve it. Since March a lot has happened in Syria, we are what feels like further than ever from even thinking about peace, yet media coverage in Germany has moved on to other topics. In the political arena, negotiations are focusing on local cease-fires and de-escalation zones. But atrocities continue unabated: September was the deadliest month this year for civilians in Syria (almost 1000 civilians dead, more than 200 of them children), with daily reports of attacks on residential areas, schools and hospitals. The majority of victims were children and women. The international coalitions’ victories over ISIS came at a heavy price for civilians in Eastern Syria. The airstrikes meant to root out jihadists, but caused extensive collateral damage resulting in the deaths of hundreds of civilians. And while agreements included routes for free movement of civilians and others for delivery of humanitarian aid, neither were provided. Convoys of hundreds of civilians were stuck in the middle of the Syrian Desert by American airstrikes preventing it from reaching its destination. Other areas saw direct attacks on medical facilities depriving the people in need of their right to life-saving medical care. The Syrian regime deliberately continues to block access to vulnerable people in need using the deprivation of aid as a weapon in its war against its own people. And the notorious detention centers and prisons of Syria’s complex system of competing intelligence services continue to be black holes: those inside do not have access to a lawyer, thousands are documented to have died in custody, starved to death or as a result of torture. Their relatives do not know of their whereabouts and are left paralyzed, in the unknown – especially for wives not only a personal tragedy, but also a societal one. In a deeply patriarchal society that is Syria, they are left without rights and subjected to abuse and exploitation. We might not know all the details of the war in Syria, but we do know this: many different actors commit atrocious crimes in this war. The so-called IS and other violent extremists, foreigners from Europe and the Middle East and Central Asia commit war crimes on a daily basis. But the perpetrator of most crimes by far is the Syrian regime under Bashar Al-Assad itself. And, let me be clear – not as the infamous “collateral damage” we keep hearing about, but as a deliberate strategy of war, to eliminate, humiliate and mute all those who are not pledging unconditional allegiance to the regime. What happens in Syria poses a very serious question to all of us: what to do in the face of powers and actors, who have no respect for human rights, international law and norms, and know no humanity. Multilateralism is failing the Syrian people, the UN Security council is not fulfilling its duty to uphold their rights and take action to end the war. The first attempt to address mass murder in a war were the Nuremberg Trials. Its most important legacy was not the conviction of the war criminals itself. It was the message that waging aggressive wars and committing systematic mass murder of civilians is a crime that must not go unpunished – that you don’t get away with it. Today these crimes are being committed in Syria – and the perpetrators are getting away with it. We have to find answers and a response to this tragedy, find means that do not leave us as helpless victims and silent bystanders in the face of gross injustice. The documented evidence of crimes committed in Syria is overwhelming – in Stephen Rapp’s – one of the crimes most renowned investigators- own words, it is the biggest volume of documents since Nuremberg. We must not allow them to be buried one day in the efforts of reconstruction. For the survivors, the experience of gross injustice will not just go away, it cannot be buried. Justice for Syria and the victims of its war cannot remain an abstract concept. The first step for survivors is to have access to justice. And while there is no prospect of an international court or tribunal for the war in Syria, in Germany we have the legal principal of universal jurisdiction. The ECCHR, the Syrian Center for Legal Research & Studies, and the Syrian Centre for Media and Freedom of Speech, as well as the ECCHR and Group around the Syrian defector Caesar are using it, to bring the evidence collected to court in an amazing effort to hold the war criminals of Syria accountable. It gives me great pleasure to see such a coalition of people working together to seek justice. I am very proud that the Heinrich-Böll-Foundation can support them in their efforts. We know that seeking justice and establishing the truth in a court is a tiresome process. A lot could go wrong. We have to be prepared that the outcome of the legal proceedings might be dissatisfying. That is bitter. And yet it is a right step – an imperative step, with so much evidence in our hands – towards justice and for Syria to build a different, a peaceful future. The people who are here as guests on our panels tonight give me the optimism that they can succeed, that there is hope, that there might be justice for Syria one day. Razan Zaitouneh, prominent human rights solicitor and leading figure in the Syrian revolution, was abducted from her office in an armed raid in the Syrian city of Douma. Our Middle East office manager Bente Scheller spoke with Pelican Mourad about the abduction.